See that little cow on the left? I really wanted to put a cow on this hoop because my grandparents were dairy farmers, and my cousin and I spent a lot of time together on my grandparents' farm growing up. I lucked out and found that little cow on (of all things) some Hello Kitty fabric I had. And the colors of the bunting perfectly match the colors in the nursery... a happy coincidence. oh, that's just sooooo cute, love it! Darling, Gwen. I also saw the little girl from that other fabric we both love. :) Wishing you a great week. Such a cute hoop. Love the cow! We have not one but TWO baby cousins on the way this year, the first one coming in the next month. Making these hoops for them is one of the things I am MOST looking forward to :-) And that little cow is so sweet, love it. 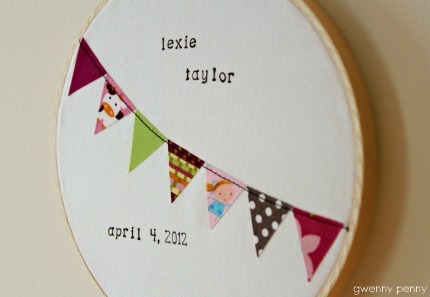 Your birth announcement hoops are one of my favourite handmade baby gifts. 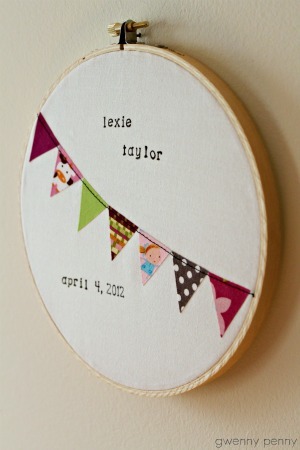 I am going to make one for my new niece. I love this project, and the cow. Vermont is a very special place. 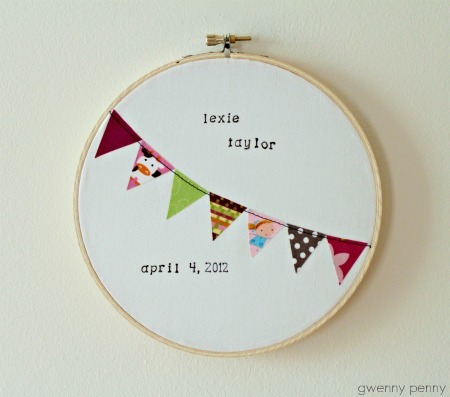 I just love your birth announcement hoops. How neat you found the cow piece of fabric. I love things with sentimental meaning. You truly make such beautiful things. I love the little cow! So darling!